Warm Audio are a relatively new Texas-based company who have set out to produce a world-class preamp for rather less than a world-class price. They've based their debut product, the WA12, on the popular old API 312 preamp design — in fact, they feel that it's close enough to the original that on their web site they're able to call it a 312 'clone'. As with others who've produced 312-inspired preamps (BAE and Classic API, for example), it's not 100 percent accurate if assessed as a clone, simply because many of the original parts — the op-amps and transformers used in the original 312 design — are no longer available. 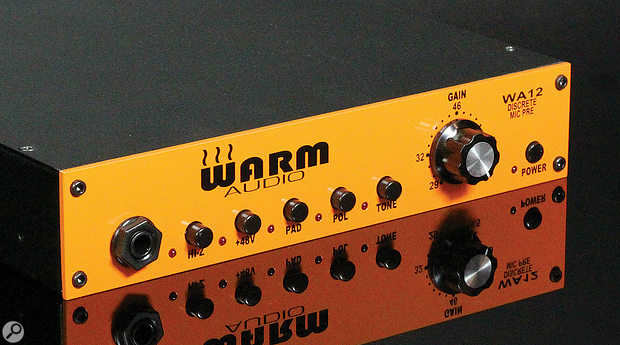 However, Warm have employed suitable high-quality replacements, including custom-wound Cinemag input and output balancing transformers, which are similar to those used in many more expensive products. Warm Audio's Bryce Young says that he used to charge $1650 for two channels of this circuit, but that with the WA12 he aimed to disprove the "glass ceiling theory that one must spend $1000+ to get a world-class preamp.” Where once there may have been such a ceiling, I'm not so sure there is one today, because I could name quite a few good preamps that are available for less that that figure. An obvious point of comparison would be the Golden Age Project Pre73 (a Neve 1073 preamp clone), the basic version of which is slightly cheaper here in the UK — but by the time you've gone for the Carnhill transformer option on that, the prices are broadly similar. The two classic designs offer rather different sounds, though, and there are few preamps in this price range that can offer the same 71dB of gain as the WA12. The WA12 has most of the features you'd hope to find: there's a high-impedance (2MΩ) instrument input on the front panel, a polarity-invert button (which, commendably, has not been incorrectly labelled 'phase'!) and 48V phantom power, which is switchable from the front panel. The gain control is stepped, which aids recall of settings, but to keep costs down this is actually a variable pot, rather than switched resistors. There's also an intriguing 'Tone' button, which, it turns out, switches the input impedance between 600Ω and 150Ω. Using that button also results in a slight level change, which makes direct comparison between the two settings tricky, but in my tests there was certainly a perceptible tonal change when it was used with a Shure SM57 (dynamic mics, including passive ribbon models, seem to be much more sensitive to changes in impedance than condenser and other active designs). The price/performance ratio of the WA12, then, is impressive and although the price is reflected in some of the build details — the no-frills metal enclosure, and the external in-line AC power supply, for example — I could detect no compromise in the areas that count. The components used in the signal path are all of high quality, and the expertise that has gone into developing and laying out the circuitry is evident: there's no sign of any corners having been cut here. Despite my comments on the enclosure, I have to admit that it's solidly constructed, and that the bright (garish?) orange and black paint job is of decent quality. When used for modest amounts of gain, the difference in sound between preamps is always small in relation to the rest of the signal chain, but there is a difference, and to my ears the WA12 strays further from the norm than most preamps do. I'd describe the sound of this preamp as solid, thick and rich, with a tightness at the bottom end combined with a gentle softening of higher frequencies, resulting in an identifiably 'vintage' sound. It has a particularly pleasing effect on electric bass and guitars, but its applications are certainly not limited to those instruments. It's certainly not the most transparent-sounding preamp, but that's really not Warm Audio's aim here — and if that is what you want, the world is awash with devices that offer bags of clean gain! I often like to try pushing a preamp by feeding loud signals into it, particularly with transient-rich material such as drums, where the brief peaks overload the analogue circuitry, because more of the device's character becomes apparent, due in large part (I suspect) to the sonic contribution of the balancing transformers. The WA12 behaves rather nicely in this respect, and the -20dB pad allows you to feed in line as well as mic signals. As with the original API design, there's no built-in output attenuation, which means that this sort of 'driving' job is only really achievable if you follow the preamp with an external attenuation stage, whether that be a dedicated attenuator or another processor. It's a shame, in a way, as it should be easy and cheap to incorporate such a stage in a design like this without compromising the purity of the original design, and it would make the WA12 more versatile. The only other thing I missed was a high-pass filter, to cut out unwanted knocks, pops and rumbles. That said, it seems rather uncharitable of me to grouch about things as small as this, given the price and quality of what's on offer. While testing the WA12, I had access to a couple of broadly similar-sounding preamps — an API 512c and a Classic API (Classic Audio Products, Illinois, not to be confused with API themselves!) VP28, both of which are available only in 500-series format, and the WA12 can hold its head high in this company. The latter of these two, in particular, offers a few more options, notably the output level attenuator, but it's not available stand-alone, and although the price is low, it's a DIY build! If you're in need of a stand-alone external preamp, then, and want it to add a little coloration to your signals, I'm happy to recommend that you consider the WA12.